One of the founding principles of the Church of England when it originally broke with Rome was that church services should be “understanded of the people” (as it is stated in the Articles of Religion) so that everyone present might be able to follow the liturgy and know what is going on. Accordingly, once the Book of Common Prayer was created in English, it was therefore subsequently translated into many languages, as needed. David Griffiths, in his Bibliography of the Book of Common Prayer, records translations and original BCP's in 199 languages other than English. The Book of Common Prayer among the Nations of the World, published in 1913, seeks to describe all of these translations, both of the Church of England and of the American Episcopal Church, as they were at that time. 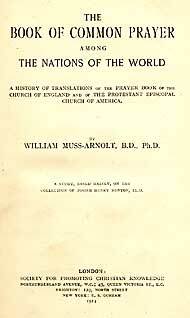 The author, Dr. William Muss-Arnolt, was a linguist at the Boston Public Library. The book's primary (but by no means only) source was the Common Prayer Book collection of J. H. Benton; this collection is now at the Boston Public Library and its catalogue is available from the Internet Archive. The complete text of the book is presented here, as it was in the original, to the extent that HTML will allow. Additionally, the individual BCP's discussed are identified by their reference number from Griffiths’ Bibliography of the BCP. Also, scans are included of a number of title pages of the BCP translations. Nearly all of these are from the web author’s collection. We also have the entire book available as PDF graphics - see link below at right. This file includes bookmarks and extractable text, although the text has not been proofread and so contains errors. Some background material may be found from the book, A Century of Achievement : The History of the New York Bible and Common Prayer Book Society, available from the Internet Archive as Vol. 1 and Vol. 2. Finally, please note that the spelling of languages and place names may be different in this book from what is now accepted. Also, while we have attempted to record the various BCP titles and such exactly as they appeared in this book, there were a good number of instances where a required diacritical marks were not part of Unicode, and therefore could not be rendered into HTML. In such cases the diacritical marks were ignored or, if there were many of them, the text was rendered as a graphic. VIII. — Bishop Phillips and the Translations into Manx: Its Ill-fortune and very Recent Publication — The 1765 Translation — Mark Hildesley — Subsequent Editions of the “New Version,” by the S. P. C. K.
XXXVI. — Burma, I.: The Work of the S. P. G. among the Burmans — The First Burmese Translation, by Cockey, Shears and Marks — Dr. Marks’ Remarkable Work at Moulmein — The r876 Revision — The Editors and Revisers — The Tentative Edition of 1894 — The Latest Revision of 1910. XXXIX. — Borneo, II., The Sea-Dyaks and the Land-Dyaks. The Nicobar Mission: The Pioneer Work of Bishop McDougall and Walter Chambers — John Perham, the Scholar among the Missionaries — Editions of the Dyak Prayer Book, from 1865 to 1892 — Chalmers’ and Glover’s Translations for the Land-Dyaks, 1860 — F. W. Abé’s Version of 1865 — Its Revision by C. W. Fowler, 1885-6 — The Faithful Work of the Tamil Catechist Solomon on Car Nicobar. XLV. — The Melanesian Mission, I.: George Augustus Selwyn and the Beginning of the Mission — Bishop Patteson’s Linguistic Work, assisted by Lonsdale Pritt and John Palmer — Mota Translation of the Prayer Book, R. H. Codrington and J. Palmer — Bice’s Version of Portions of the Prayer Book into the Walurigi Dialect of Oba — Translation of the Liturgy into Maewo and. Arag, the latter by Thomas Ulgau, a Native of Mota — Revision by Brittain and Edgell. LXI. — Nigerian Languages, V. : The Sherbro and Tem(ne) Service Books — The Work of C. F. Schlenker, and of J. A. Alley — The Yoruba Mission, Townsend, Gollmer and Samuel Adjai Crowther — Translations of the Liturgy, by King, Crowther, etc. LXVIII. — The Algonquian Family, II. : The Cree Indian Prayer Book — Early Missions — Archdeacon James Hunter and his Wife Jean, née Ross — His Several Editions of the Liturgy — John Horden, the Apostle of the Hudson Shore — His Translations of the Liturgy.